Samples of the yarn and fiber are provided at Customer's Request. 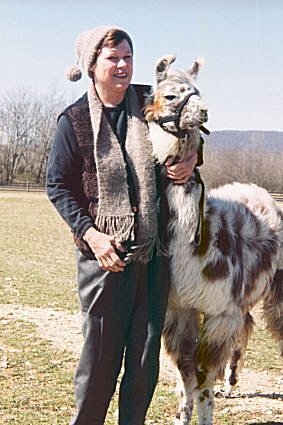 After shearing the llamas every Spring, we set aside the finest fiber to make yarn, scarves and hats. We will provide you with the name and photo of the llama or alpaca that contributed the wool. Raw fleeces and processed fiber is available. 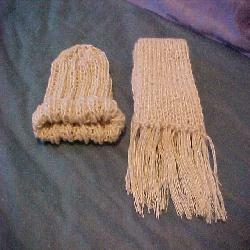 Some hats and scarves are available; others are custom orders. The photos may not do justice to the QUALITY of the products. Proceed to the order form, where you can purchase these great products or call me. Hand-spun, hand-knitted scarves in 50% Home Grown Llama, 25% Alpaca and 25% Australian Merino are available. We offer a wide-variety of natural solid colors that can be custom ordered. All scarves are knitted by Cozette in the color and pattern of your choice and fringed and hand-knotted with yarn of the same color. We all love to wear them! Reverse Side of Molly Llama Apron with Pockets.